Ankle sprains are one of the most common sporting injuries. A sprain can be defined as the tearing of one or more ligaments in the ankle. 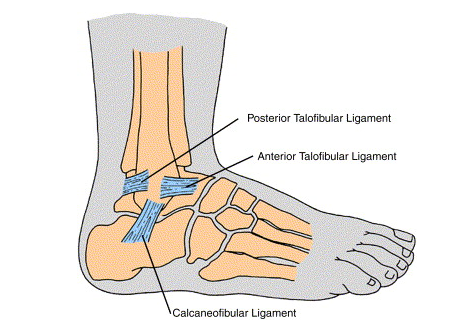 Most ankle sprains are likely to affect the lateral ligaments (around 80% of sprains) of which the anterior talofibular ligament (ATFL) is most common. Following a sprain the ankle joint may become unstable and will take some time to recover. It is important to manage and rehabilitate the injury correctly in order to prevent further injury. Other risk factors include the playing surface condition, shoe type and the type of sports and activities undertaken. Ankle sprains are more likely to occur during sports which require jumping, turning, twisting and fast changes of direction. They can also occur in a non-sporting environment from rolling the foot when walking on an uneven surface or slipping on a floor. Ankle sprains are diagnosed from Grade 1 to 3 depending on the severity. An x-ray can rule out a fracture and an ultrasound or MRI can be performed to determine the severity of ligament damage. Golf ball swelling with or without bruising, pain and increased pain when weight-bearing, and restricted movement of the ankle. Golf ball swelling, bruising, pain, inability to place weight through your foot and restricted movement of the ankle and foot. Balance exercises and strengthening of stabilising muscles around the ankle will help prevent ankle sprains. Stretching will also maintain ligament flexibility and joint mobility to help reduce the risk. If you have a history of ankle sprains taping the ankle can help provide some stability whilst performing activities and sports that put you more at risk. Ice will be helpful in the first 72 hours after injury to reduce the amount of swelling and for pain relief. Elevation and compression are also helpful for swelling management which will in turn prevent joint restriction. Avoiding heat, alcohol and excessive weight bearing in the initial 72 hours after injury will also prevent excessive swelling and joint irritation. It is also important to seek advice from a physiotherapist on the grade of the injury as there can be multiple ligaments that have been sprained and also it is possible that there could be a fracture or a muscle strain. The length of time sprains take to heal varies greatly on the grade of sprain, whether multiple ligaments are involved and the amount of swelling. If it is a low grade sprain it can take 2-4 weeks before being able to return to sport however, this can increase to 6-8 weeks if it is a high grade sprain. A physio will be able to determine the most appropriate rehabilitation programme based on the level of sprain and other associated signs and symptoms. This programme will usually involve strengthening exercises, balance, mobilisations to improve range of movement and/or taping techniques. Taping can be beneficial in the first weeks after a sprain to prevent a repeat injury particularly when returning to sport.